With five weeks between the Luxembourg and Japanese Grands Prix Ferrari and McLaren spent their time testing and playing psychological games in preparation for the World Championship showdown in Suzuka. In qualifying Michael Schumacher beat Mika Hakkinen to pole by a tenth of a second. This was an astounding performance by Schumacher as his Ferrari team mate Eddie Irvine was almost two complete seconds slower. Irvine could not explain what had happened because he had no problems with his car and felt that fourth place was the best he could do. The feeling in the paddock was that Michael's result was a little fishy but the FIA said the car was legal. David Coulthard was third on the grid only a second slower than Hakkinen. Behind the top two teams everyone else was in team order with Williams on the third row (Heinz-Harald Frentzen ahead of Jacques Villeneuve), Jordan on the fourth (Ralf Schumacher again outpacing Damon Hill), Benetton on the fifth (Alexander Wurz ahead of Giancarlo Fisichella), Sauber on the sixth (Johnny Herbert outgunning Jean Alesi on this occasion) and Prost on the seventh (Olivier Panis beating Jarno Trulli). Everyone was very edgy at the start with Trulli stalling as they waited for the lights to go out. The start was aborted. At the second attempt Michael Schumacher's Ferrari stalled. He would have to start at the back. Suddenly the pressure was off Hakkinen. He was on pole and there were 20 cars between him and Schumacher. At the third attempt the race got underway with Hakkinen leading Irvine, Frentzen and a slow-starting Coulthard. Schumacher drove a storming first lap to be 12th and his progress in the early laps continued until he became stuck in seventh place behind Villeneuve and Hill. In the laps that followed he lost half a minute to Hakkinen and all realistic chance of winning the race and the championship seemed to disappear. The frontrunners soon began to pit and thanks to some very fast laps Schumacher emerged in third place ahead of Coulthard, Frentzen, Hill and Villeneuve. 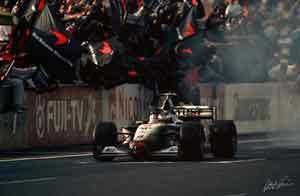 In the next few laps Irvine was unable to make much of an impression on Hakkinen and on lap 28 he stopped again, indicating that he was on a three-stop strategy. The World Championship was settled moments later when Schumacher suffered a right rear tyre explosion after running over debris from a crash between Esteban Tuero's Minardi and Tora Takagi's Tyrrell. Hakkinen had little time to celebrate and stopped immediately for new tyres to stay ahead of Irvine, who had another pit stop to make. The Ulsterman managed to stay ahead of Coulthard but was in no position to challenge Hakkinen. The new World Champion duly won his eighth victory of the year, trailed home by Irvine and Coulthard. The battle for fourth place was only decided at the last corner when Hill dived past Frentzen.